It has been four years since Niniola graced the reality show Project Fame and stepped into our living room and lives with the fantastic facility of her vocal cords. The journey has not been smooth and the connection between reality talent shows and reality itself is still staggering. No matter, Niniola is one of those golden voices that shine when they want to shine. The build-up to the album has been measured, if not gradual. It did not begin in 2017. Niniola has been gracing the stage and doing energetic live music performances for some time now. She appeared at Freedom Park where Afropolitan Vibes, the former monthly but now quarterly live music concert used to hold. She was one of the few musicians who participated at King Sunny Ade’s grand 70th birthday concert December last year. In fact, she covered, rather competently, Sokoyokoto from his 1987 Jealousy album. Fast forward one year and Niniola’s debut, This is me, falls upon us. The well-meaning but weak album title notwithstanding, one must note that the year has had lines falling in pleasant places for the diva. Like Simisola, who hails from Ondo state, Niniola also belongs to the crop of creatives who waded their way into Lagos by their heels from the hinterland. 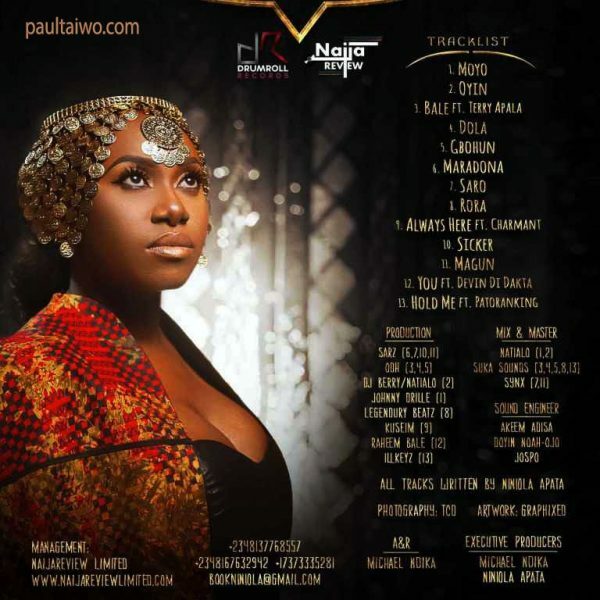 Full Name Niniola Apata is a proud indigene of Ado Ekiti which she definitely claims in the hook of Gbohun, mid-way into her album. 15 minutes short of one hour, This is me does not only feature Niniola’s vocals. She gets assists from four male musicians: Nigerian Neo-Apala Prince Terry Apala on Bale, Ugandan-based Congolese Charmant Mushaga on the Makossa-inflected Cabaret-styled Always Here, Jamaican superstar Devin Di Dakta on the dancehall-tinged You and Nigerian Patoranking on the mid-tempo sultry Hold Me. The tracks exclusively featuring Niniola’s vocals are better realised but it is difficult to dismiss the retro and stylish nature of the gem Always Here and Terry Apala’s matchless verse on Bale. Niniola comes across strong on almost every track on the album. The album is lean and limber. It is Niniola wielding her vocal cords and staking her claim to the great Nigerian diva title. This album courts the popular. It signposts popular trends with nods every so often but many times the music deviates away from the popular to situate itself in its niche. Niniola is unapologetically a House Musician even if she ever so lightly crosses the Rubicon into what is popular. Innovative is her ability to couch her lyrics in mellifluous Yoruba and to code-switch as often as her material demands. In Oyin, she uses a Yoruba proverb as scaffolding to describe forlorn love. Dola is hippy and energetic spotting a simple Yoruba hook. Niniola sings more in Yoruba than she does in English and doing House music in this manner is exciting for the zeitgeist. By the time the album spools to the previously released single Maradona, which chronicles the desecration of a woman by a Lothario, the listeners would have let his/her guard down, to let the repetitive and recurring percussion and rhythms of Niniola’s self-branded Afro-House perform an incursion on their body. You may catch Easy-sque inflections on the mid-tempo Sicker. We already know how sickness became a place-holding metaphor for ‘Wokeness’ a few years ago. This is me is that album that will pervade the house music scene. Imagine: Niniola’s music and strobe lights and cocktails and bodies willed to methodical movement. This is me already sounds like the real deal. Quite exciting is how Niniola has been able to touch all cardinal points of her experiences as a woman, Yoruba and her cosmopolitan appeal. Of course, she got help from a slew of music producers—like Sarz, Raheem Bale, Natialo and Legendary Beatz amongst others—but the delight of her music is how she enunciates her lyrics and bends them around the thumping beat. This is Niniola’s first and hopefully the delightful sound of what we should expect for the entire span of a prodigious career.